He says the boy can afford those Louis Vuitton loafers. Amid the pseudo-furor over his grandson Joseph Luis "Jolo" Estrada’s Instagram posts projecting a posh lifestyle, Manila Mayor Joseph "Erap" Estrada dismissed critics by saying that the boy can afford to buy pricey things. 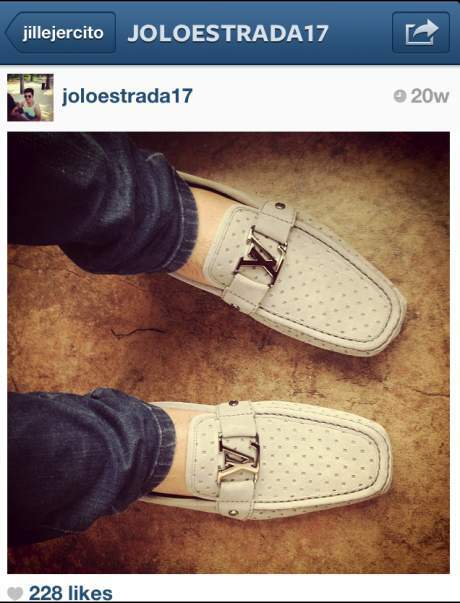 Among the high-end items featured in Jolo’s IG posts are a pair of Louis Vuitton loafers. In a PEP.ph article by Arniel C. Serato, the Estrada patriarch was quoted as saying, "Sapatos lang 'yan, e, kayang-kaya niyang mabili. Sapatos lang (Those are just shoes so he can easily buy them. They’re just shoes)." According to the PEP.ph article, the doting grandfather had explained that Jolo has money from his showbiz jobs. Also featured in one of Jolo’s IG posts was a shot of himself and his brother, Julian Emilio, inside what appeared to be a private jet. Well, his grandfather has also dismissed the allegations concerning the luxury "ride." The clan doesn’t have a plane, he said. Meanwhile, Jolo’s uncle, Jude Ejercito also explained that Jolo’s stay at the Manila Hotel’s presidential suite (also detailed in one of the boy’s IG posts) had been "complimentary." Uh...OK...if that’s what you guys say.